It’s kind of amazing how travelling changes you. Opens you up to adventure, new experiences, new people. Only a few hours after we said goodbye to our families, switching from ‘vacation’ mode to ‘backpacker’, we met a Brazilian couple who gave us tips on everything from how to ward off the Zika virus to the best places to eat in Rio. We exchanged email addresses and they told us to get in touch if we needed anything once we arrived. Travel magic at its best. It’s officially been eight years since my last gap year – and in many ways, not much has changed. I’m older and (hopefully) wiser, but I’m still using the same backpack, sleeping bag and packing cubes as last time. The backpack in particular has seen many corners of the globe; she also accompanied my sister Sophie on her gap year adventure! I can definitely vouch for the longevity and durability of a Lowepro bag. I’m taking more or less the same amount of clothes, and I still remember that the most useful thing I brought with me was my sarong. But what has changed is the sheer amount of technology that is accompanying me this time around. Whereas in 2007 I travelled with a flip phone, iPod and a point-and-shoot camera, this time I feel like I’m carrying around my own Best Buy superstore. I guess that’s the burden that comes with being a ‘digital nomad’. I do have The Potion Diaries book 3 to write on the road, after all! But probably the most important items we’ve packed are our travel mascots… Kylo Ren and his minion! I initially bought a Disney Star Wars vinylmation hoping to get BB8 (it’s a lucky dip out of 8 different characters) but decided I wouldn’t mind getting Ren, Poe, Finn… but I ended up with Kylo. While initially I was a tad disappointed, it all works out now that Lofty’s mascot is a minion 😉 Look out for KR and minion showing up all over South America. 1. Best if you have three months or more: Find a Groupon/Amazon Local deal! Lofty found a brilliant deal on AmazonLocal that offered a 12-week Spanish course for only £79 with the Elegant International College in London. Definitely worth every penny! With a course over 12 weeks, he really got to know the teacher and the other students, so he was able to meet up with them outside the classroom to help improve his Spanish even more. After 18-months, Lofty is a confident Spanish speaker and well prepared for a few months in South America! This is the course that I took over the last two weeks of November. Instituto Cervantes is run by the Spanish government as a way of promoting the Spanish language around the world – and all the teachers are native Spanish speakers. The course takes place every day for three hours a day (from 10:30-13:30) and costs £312. The class sizes tend to be pretty small, with a minimum of 4 up to a maximum of about 12 people per class. Although I initially started with the very beginner course (Inicial 1), because I had been using Duolingo (see below) I already had enough vocabulary to jump to the Inicial 2 level. I’m so glad that I did. Over the two weeks, I went from a completely shy Spanish speaker to being able to have actual conversations and write full on emails and postcards. The course is quite intense – they try to speak as little English as possible during the lesson, even to complete beginners – but I thoroughly recommend it if you get the chance before you go. They also give you a ‘qualification’ at the end of the course which allows you to pick up a Spanish language course anywhere around the world. I downloaded a bunch of Spanish apps to help me learn, but the most useful one has been Duolingo (and bonus: it’s free!). It’s easy to use, fun, and has really helped improve my vocabulary. The biggest drawback to Duolingo is the fact that you don’t say much out loud – and you don’t get a chance to interact with anyone, so translating Duolingo knowledge into an actual conversation is tricky. That’s why I would thoroughly recommend taking a course as a way to cement that knowledge! A bit on the expensive side, but well proven to be one of the best pieces of software for learning Spanish on your own! I have yet to use it but have heard only great things. I have the Latin American Spanish version, level 1 and I’ll be adding it to my laptop for learning on the road. Lofty and I are unfortunately starting in Portuguese-speaking Brazil, so we’re not able to do a homestay. But if my experiences learning French are any indication, becoming fully immersed in the language with a homestay is the only way to become truly fluent. Oasis Overland offers week-long homestays as ‘added extras’ on most of their South America itineraries. I would also like to download some great (but easy) Spanish-language podcasts for the road – does anyone have any recommendations? We’ve been listening to Coffee Break Spanish and Show Time Spanish but always looking for others! Goodbye Real Life – Hello South America! Since Lofty handed in his notice and I’ve gone full-time freelance, the question we’ve been asked most is: What now? This is the Kingdoms and Carnivals route of our upcoming South American adventure, run by my favourite travel company, Oasis Overland. I travelled with them from Nairobi-Johannesburg back in 2007 and I just love their itineraries and their ethos – they’re all about off-the-beaten track adventure mixed with the opportunity to make great friends. Everyone is expected to muck in with the cooking, cleaning and set-up, but the Oasis crew take care of the sticky business of how we get from point A to B! Lofty had a taster of an Oasis trip when we used them to travel in Egypt and Jordan in 2012, and he was hooked. The trip begins almost exactly 8 years since Lofty and I first met in Christchurch, New Zealand, on our respective post-university gap years. We met in a hostel kitchen, fell in love pitching tents on secluded beaches, and together experienced some of the most beautiful places on this earth. From that moment onward, our fates were sealed: our life together was always going to feature travel in a big way. But reality also beckoned. We both wanted long-term, sustainable careers in addition to lots of travel. (Nothing like wanting it all!) For the years that we were settled in the UK, Lofty worked and qualified as an actuary and I worked in publishing and wrote my books. We travelled as much as we could in Europe (and sometimes beyond), taking advantage of the cheap airfares, long holidays and short distances. We also, you know, got married, bought a flat, bought a car… all the trappings of a life most people would dream of. Yet our dream of travel was still alive, and we knew we had to somehow fit in one more big trip before we added ‘family’ to the above list. Now we’ve jumped in with both feet! We’ve sold the flat (and all of its contents!) and moved in with very generous friends, sold the car, quit our day jobs, and put everything remaining into storage. Our flights are booked, the trip is paid for, the backpacks have been dragged out from under the bed and are filled to the brim. All that’s left to do is fly! Has anyone been to these places? We are collecting must-dos and would love your tips! Otherwise, follow the blog for more tales of our adventures… setting off on 4 February 2016. I’m practising “blogging” directly from my Flickr account. Unfortunately I have only two pictures on the account right now, but I plan on filling it up as the trip progresses.This picture is of my backpack! 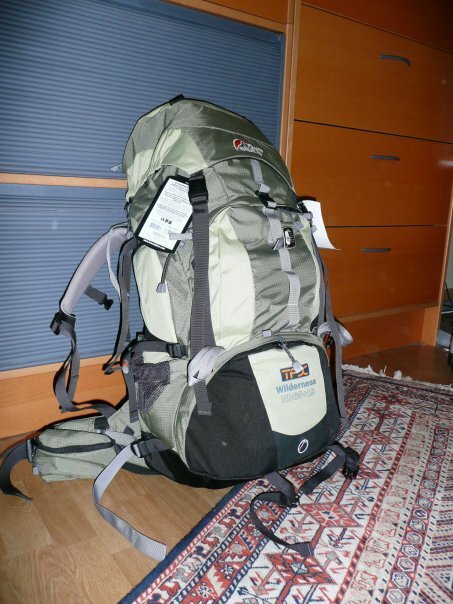 I’m really happy with it, and although I wanted to get a 55L pack, I would never have been able to fit a sleeping bag and all the sleeping accoutrements (like the therma-rest and liner) in a smaller pack. Perhaps if I travel in the future without sleeping stuff, I will be able to go with something smaller. But for now, this works for me! It is super comfortable with a unique hip belt that moves independently from the rest of the bag, to make walking much easier. Also, it’s a ND (narrow dimension) pack, which means that it is better suited for women. I tried on many different bags and this definitely worked the best.So what’s in there? My packing list looks long, but I’ve definitely tried to keep things as “light” as possible. Can’t think of anything else at the moment… I’m sure there’s more stuff in my bag that I can’t remember! The scariest part is thinking about carrying my life for 10 months on my back. But luckily I’ll be able to share clothing with my travel partner Sarah and I’m sure anything I’ve forgotten will be remembered by them. With only 8 days left until my flight, I’m supposed to be in countdown mode. Instead, I feel like I’m still ‘crossing off’. My to-do list is still a million miles long, but today I finally feel like I can see the end of the road (or the page, as it were!). I took my number and stood in line to notify the province of Ontario of my extended absense, I got my international driver’s permit, I phoned VISA and changed my address and informed them of all the countries I would be visiting. The best thing about all these tasks was talking to people about my trip and having them share in my excitement. I was feeling lost these past few days — lost in missing people, in facing the fact that I will be away from my family and friends for 10 months, in wondering about how leaving would affect my future plans. But nothing brings the excitement swelling back than by having people, random strangers even, remind me of how much of a BIG DEAL this trip is. This is every cliché: a once in a lifetime experience, a dream trip and it will change my life forever. I can’t thank Sarah enough for allowing me to hijack her trip and tag along. She had been planning this trip with Jason (whom I’ve yet to meet!) long before I decided to join them. Their plans to “travel around Africa by truck” were too good a deal to pass up. Africa, especially Kenya and Tanzania, have been dream destinations of mine since Roald Dahl’s Going Solo. Pile on the rest of the itinerary and you’ve got an irresistable trip!! I plan on blogging with regularity throughout my trip. So keep checking back! If you would like a postcard, then e-mail me your address at mcculloch.amy @ gmail.com (no spaces) or visit my facebook profile.